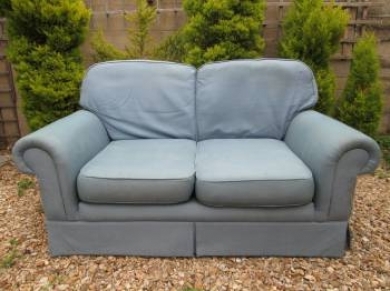 A lovely sized and styled two-seater modern sofa. This beech wood framed sofa has 2 seat and 2 back cushions (you can choose your comfort density at Chairs of Oxford, firm through to soft cushioning). This sofa will be fully restored with new springing, foams, padding etc, to the latest fire retardant specification. Please phone for more details so that we can calculate the best possible price for you. Dimensions - height 87 cms, width 162 cms, depth 95 cms. (Sofa requires 7-8 metres of fabric, you can provide your own or we can help you choose and purchase from our large selection).